: Standard Size Watchdog. Intermediate Size Watchdog. Miniature Size Companion Dog. : Federación Canófila Mexicana, A.C. Original version (ES). Revised by Renée Sporre-Willes. : Their origin dates far back in history. The meat of the Xoloitzcuintle or Xoloitzcuintli in Nahuatl language, Xoloitzcuintle in Spanish was considered a delicacy in pre­ Hispanic Mexico, eaten by the indigenous Mexicans in special ceremonies as a ritual to their beliefs and was regarded as a representative of the god "Xolotl", from which its name obviously originates. : The Xoloitzcuintle is an ancient natural primitive dog, modelled by evolution, going by the general conformation, it is a very attractive slim and elegant dog, moderate in all aspects, that express speed, harmony and strength without appearing coarse, possess a clean cut outline, it has a well-proportioned body, chest is ample, ribs well sprung, limbs and tail are long. There are two varieties in the breed, hairless and coated, both identical in conformation except for coat and dentition. : The body, measured from the point of shoulder to the point of buttock and from the highest point of the withers to the ground, is slightly longer than high approximately 109. Females may be slightly longer than males due to their reproductive function. The skull and the muzzle are approximately of equal length. There are three sizes in the breed, all lean and sturdy, well-muscled, with a spacious ribcage and moderate bone, the outline is rectangular and the distance from the elbow to the ground is equal to or slightly greater than the distance from the withers to the elbow. : The Xoloitzcuintle is a silent and calm dog, cheerful, alert and intelligent, he might be suspicious toward strangers, he is a good watchdog and an excellent companion. He is never aggressive. The coated variety should be equal in every aspect. : Broad and strong, wedge-shaped. Seen from above it is wide and elegant; tapering towards the muzzle with an occipital protuberance that is not well-defined. The skull and muzzle planes are almost parallel. : Slight, but well defined. : The nose should be dark in dark-coloured dogs. It can be brown or pinkish in bronze-coloured dogs, spotted in spotted dogs. : Seen from the side, the muzzle is straight and the upper and lower jaws are square and very strong The tongue is generally pink but may have black markings, spots or marks, which is a common characteristic of the breed. The tongue is always inside the mouth, a paralyzed tongue hanging outside the mouth is disqualifying. : Tight and close fitting. : Both varieties with strong jaws. The incisors should close perfectly in a scissor bite with the superior incisors overlapping; the interior surface of the superior incisors touching the external surface of the lower incisors, set square to the jaw. A level bite, edge to edge, is also permitted. Hairless variety: Complete set of incisors is preferred. The absence of a few incisors, canines, molars, pre-molars or rotated teeth should not be penalized, as many dogs do not have deep roots. Genetically, the absence of hair is closely linked to the absence of teeth. Coated variety: Full dentition (42 teeth), a scissor or pincer bite is required, normally developed and normally positioned teeth. : Medium size, almond-shaped, with an alert and very intelligent expression. The colour varies according to the skin/coat colour in black, brown, hazel, amber or yellow tones. Darker colours are preferred and both eyes should match. The eyelids should be well-pigmented black, brown or grey in dark-coloured dogs. Light-coloured or pink eyelids are tolerated in light-coloured dogs but this is not a desirable colour. : In both varieties the ears are long, large, expressive and very elegant and of fine texture; they are reminiscent of “bat” ears. They should be held erect when alert. In the alert position their axis should be 50 – 80 degrees from horizontal. Both ears should be in the same position, when alert. Droopy or cropped ears are disqualifying. : In both varieties the neck is carried high, smooth and dry. Slightly arched. Proportionately long. Slim, flexible, well-muscled and very elegant. The skin on the neck is firm, elastic and close-fitting, without dewlap. Puppies show folds which disappear with age. : Perfectly straight and level. : Short, strong and firm. : Profile should be slightly convex with an inclination of approximately 40 degrees to the horizontal. : Seen in profile it is long and deep, descending to the elbows. The ribs are well sprung, not exaggerated, nor flat. Seen from the front the upper chest is of good breadth. The point of the sternum should not protrude. : Graceful line. Abdomen muscled and moderately tucked up. : Long, thin and may have some tufts of hair, tapering from the base to the tip in the hairless variety, and completely covered with short hair in the coated variety. In movement, it is carried up in a curve, never touching the back. When resting, it should hang with a slight curve at the end. Sometimes it is placed between the legs due to cold temperatures. The tail should nearly reach the hock. The tail set should be an extension of the croup when the dog is at rest. : Flat and muscled with good scapula-humeral angulation which allows a long, free and elegant stride. : Strong and firm. They fit close to the chest, never turned outwards. : Forelegs seen from the front are straight and perpendicular to the ground. : Firm and almost perpendicular. : Of medium length (hare’s foot) with toes arched and close together, may have short coarse hairs in the Hairless variety, and be covered with short hair in the Coated variety. Nails are black in dark-coloured dogs, and lighter in bronze or blond dogs. The nails should be trimmed. The foot pads are strong and very resistant to any terrain. The inter-digital membranes are well-developed. Dewclaws should not be present on all four limbs except in countries where it is illegal to remove them. : The hindquarters should be strong and well-muscled. Seen from behind they are perfectly straight and parallel and never close. The angle of the pelvis to the upper thigh joint, stifle and hock, are adequately open to permit both free and strong movement of the legs. : With a moderate bend. : Cow hocks are highly undesirable. : The dog should move freely with a long, elegant, springy step; the trot is quick and flowing with head and tail carried high. Hindquarters with free and strong movement. : Hairless Variety: Due to the total absence of hair, the skin of this breed is of great importance. It is smooth, sensitive to touch and feels warmer because of direct heat emission due to the lack of hair; however its body temperature is the same as in other dogs with hair. The difference with haired breeds, which disperse body heat through natural ventilation, is that the skin requires more care from exposure to the sun and elements due to its lack of natural protection. Accidental scars are not penalized. The dog tends to sweat through its feet (foot pads and inter-digital membranes), which is why it seldom pants, except in extreme heat. It should be free of obvious skin problems. Hair other than short or smooth in the coated variety. : Preample: The gene that produces the absence of hair is dominant. Nevertheless, some puppies are born with a coat. The hairless to hairless breeding will produce the least numbers of coated dogs therefore this has been preferred. It has been proven that this breeding maintains and improves the quality of the breed. 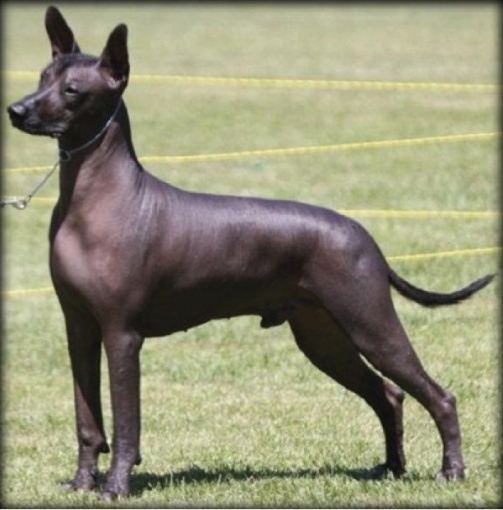 For providing genetic diversity, well-constructed coated Xoloitzcuintles, with excellent type, conformation, standard accepted colours and coat, may be used for breeding purposes. 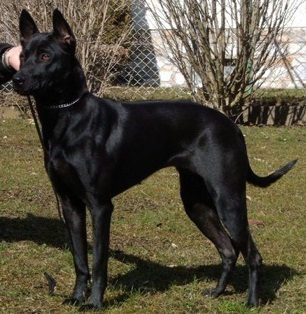 The breeding between two coated Xoloitzcuintles is not permitted. Xoloitzcuintle coated breeding stock must be the offspring of registered parents with at least three generations of hairless to hairless breeding. The coated variety must be evaluated as a true breed at dog shows, to be able to be bred to hairless dogs only. N.B. : Only functionally and clinically healthy dogs, with breed typical conformation should be used for breeding.